The peaceful life of the animal kingdom of the Island of Flowers and Fruit is disturbed by the return of Demon King who is driven by a burning desire to avenge his defeat, drive the Jade Emperor from his throne and gain control of the Heavenly Armies. A witch has told him Sun Wukong is the key to that victory. The Demon enlists an unwitting Silver Fox to help turn The Monkey King against Heaven. Demon King convinces him that he is as great and powerful as any being in Heaven and names him Great Sage Equal of Heaven. Monkey loves it. Reunited, Silver Fox and Wukong’s friendship begins to blossom into romance. Struck with the realization that his tribe and his true love are mortal, Wukong decides to use his heavenly connections to learn the secrets of immortality and the secret of Divine Breath. He is welcomed into Heaven by Master Subhuti and The Jade Emporer, who appoints him Keeper of the Heavenly Stables. There, he is thwarted by the two-faced, three-eyed warrior Erlangshen. The “Great Sage” creates havoc in Heaven, eating the divine peaches of immortality, freeing the flying heavenly horses and stealing the magic elixir from the blazing furnaces. Driven from Heaven by Erlangshen and his army, Monkey King returns home to a scene of complete devastation. He is led to believe that the death and destruction is the work of the Jade Emporer. Bent on revenge he transforms from a “Great Sage” into a Great Warrior and attacks Heaven. Buffalo Demon King joins in the assault. Monkey King, Erlangshen, Master Subhuti, Jade Emporer, and Demon King become embroiled in a series of battles summoning all their incredible powers in pursuit of the throne of Heaven. In the midst of battle the truth is revealed to Wukong. He chooses right over wrong, good over evil and joins with Jade Emporer in defending Heaven. In the process he learns a great lesson. The lesson he must learn to set him on the path to becoming the great leader he is destined to be. Along the way he will have to seek the wisdom that will prevent his great powers from ever again being subverted through deceit. In the end he faces divine retribution; but always the monkey, he pulls one last trick giving him the most meaningful victory of his magical life. We end where we began. As the Old Sage closes the last scroll we discover Wukong has been released from 500 years of captivity in Five Finger Mountain. 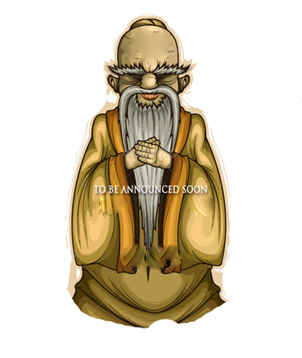 The Monkey King is poised to start his next and most amazing journey -- a Journey to The West. Copyrights 2014 © Global Star Production, Inc. All Rights Reserved. 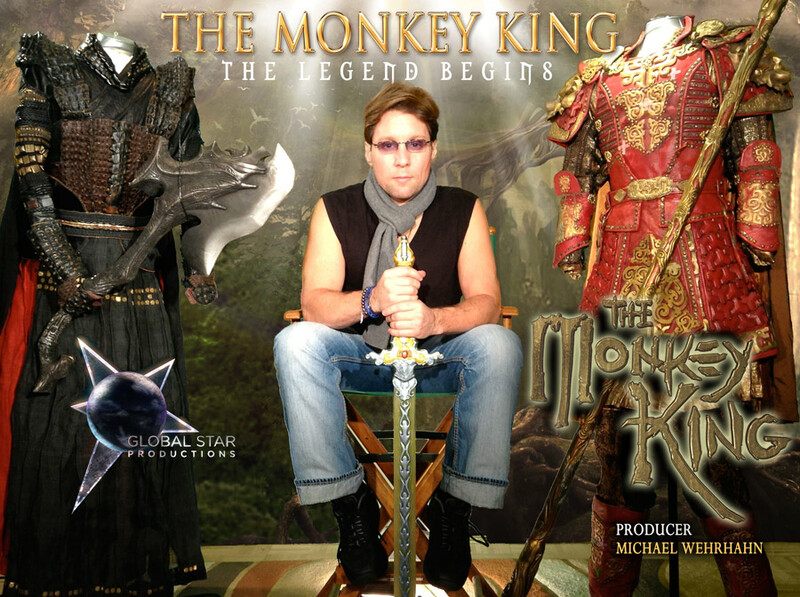 The Monkey King from Annenberg Learner. Click Here. Background: After an unsuccessful attempt to attack Heaven, The Jade Emperor banished all demons to the Flaming Mountain on Earth, where Buffalo Demon King bides until he can strike again. He is charismatic and can win over creatures not allied with Heaven. Buffalo Demon King is married to The Jade Emperor's sister. Weapons: • The Demon Axe, a magic axe which is empowered by sacrificing miserable demon souls to it. When fully empowered it can enhance Buffalo Demon King’s magic power beyond that of even The Jade Emperor. Background: The Jade Emperor is the ruler of Heaven, Earth, and Hell. Having lived through 1,750 painful trials lasting 129,600 years, he is very wise and has immense magic power. However, he is not all- powerful or all-knowing, and his reign is constantly challenged by Buffalo Demon King, his demon brother-in-law. After repelling another attack by the demons led by Buffalo Demon King, he banished all demons to the Flaming Mountain, and warned them never to return to Heaven under penalty of complete extermination. Powers: • Flight • Transforms into a giant Gold Dragon •His Breath of Life can resurrect the dead • Many other magic powers. Weapons: • The Jade Emporer has a pet dragon who can sense danger and transform into a powerful sword which he uses in battle. Background: • The Monkey King was born out of a crystal that fell from Heaven. He was freed from the crystal by Silver Fox, who asked Buffalo Demon King to free him in exchange for a favor. Sun Wukong protected and provided for his monkey tribe on Mount Huago. • The name Sun Wukong, given to him by Old Master Subhuiti, “means awareness of nothing.” • Though good-hearted and well-meaning, The Monkey King’s naiveté and rambunctiousness often causes more trouble than good. Super-strength - he can lift over 8 tons and leap 33,554 miles. 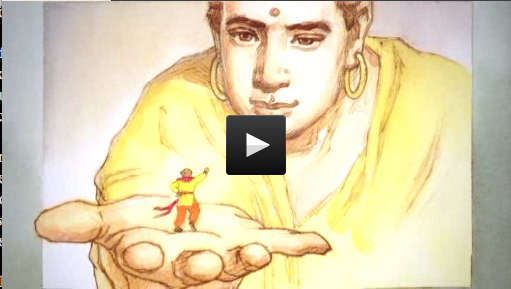 Transformations - Old Master Subhuti teaches The Monkey King 72 transformations. He can transform into a variety of creatures including, tigers, rhino's, dragonflies, and humans - although his human form is always marred by his inability to hide his monkey tail. Each hair on his body can transform into a copy of himself, capable of fighting independently before joining back together again. The Golden Cudgel (Ruyi Bang) - Is an iron rod which Sun Wukong takes from the undersea palace of The Dragon King. It is emmensely heavy, weighing more than 8 tons. 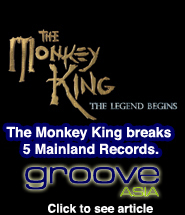 The Monkey King has the power to change The Cudgel size, multiply itself and fight according to his whims. When not using it he can shrink The Cudgel to the size of a sewing needle. The Gold-chain Armor - is a chain mail vest taken from the defeated Dragon King. The Cloud Walking Boots - also taken from The Dragon King, enables The Monkey King to walk on air. Powerful Tail -The Monkey King can also use his tail as a weapon against his enemies. Spells - He knows magical spells that can command wind and water , create protective cirlces , and freeze humans, demons or gods. Background: He is Li Jing , The Pagoda Bearer one of the Four Heavenly Kings each of which watches over one direction of the world. 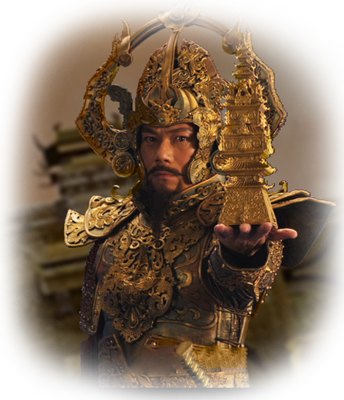 Powers: He wields a golden pagoda which enlarges to trap enemies and shrinks back down to fit in the palm of his hand. Weapons: Golden Pagoda - can entrap any spirit, demon, or deity. Background: Chang’e is a godess who collects divine energy for the furnaces in which the elixir pills is forged. The pills will multiply its user’s magical powers and grant them eternal youth and the ability to resurrect the dead. Background: Old Master Subhuti is a wise master who teaches his students magical powers such as the 72 transformations - but also wishes to instill in them spiritual refinement. He sees great potential in The Monkey King and decides to become his teacher. Old Master Subhuti gives Monkey King the name “Sun Wukong” which means, “awareness of nothing.” He also has a pet crane he rides from time to time. Powers: • Flight • 72 Transformations • Magic energy waves • Breath of Life - Can resurrect the dead. Weapons: • The Divine Lasso - magic lasso which can extend incalculable distances. The rope can only be destroyed by burning it in a powerful divine flame - like the Samadhi Flame used in the elixir furnaces. 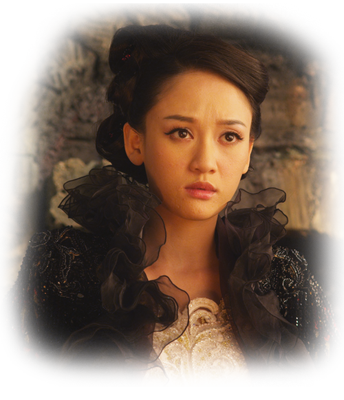 Background: As the wife of Buffalo Demon King and sister of The Jade Emperor, Princess Iron Fan is caught up in the eternal struggle between deities and demons. She hopes that her unborn half-deity half-demon child will bring peace to the world. Background: Guanyin, the immortal Goddess of Mercy exists as a higher god than the other deities, appearing to select characters only at certain points in the story. She does not directly interact with anyone or anything, but like a Guardian Angel gives guidance to characters. 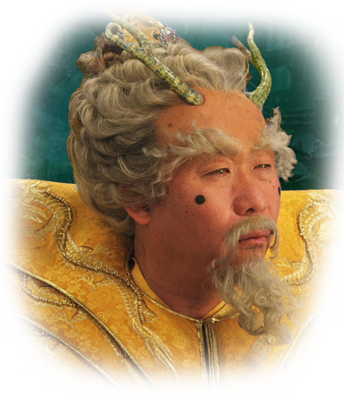 Background: The Dragon King rules over the East Sea from his undersea Dragon Palace. He has three brother kings who live in the North, West, and South seas. His treasures include many ancient weapons including the Golden Cudgel, which controlled the ebb and flow of the sea. When The Monkey King invaded his palace and killing one of Dragon King’s security guards,Tthe Dragon King intended to kill him. When that proved unsuccessful, he lent The Monkey King the gold-chain armor, cloud-walking boots and phoenix feather cap as a way to pacify him. He also offered the Golden Cudgel to The Monkey King, never thinking he could lift it as it weighed over 8 tons. Powers: • The ability to bring chaos by forming droughts, storms and other disasters. •Transforms into snakes and fish. Background: Nephew to The Jade Emperor, Erlangshen is one of Heaven's most powerful generals and is in charge of the security of Heaven. 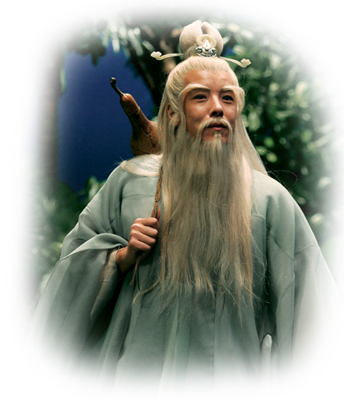 Though skilled in combat and magic, he is jealous of his uncle The Jade Emperor. He can see events both past and present and can see through deceptions. But he is not entirely beyond being fooled as his arrogance can cloud his judgement. Transformations - Erlangshen can transform instantly into numerous objects and creatures - including humans. Weapons: • Ji ( a Chinese Halberd) - A magic pole axe Erlangshen can materialize at will. Background: Silver Fox found The Monkey King in the fallen crystal and asked Buffalo Demon King to free him. In return, Buffalo Demon King asks that she fulfill a favor for him at a later date. As a minor spirit, she has a finite lifespan of about 200 years. Powers: • Transform from a fox to human form - although her tail and ears remain that of a fox in human form. 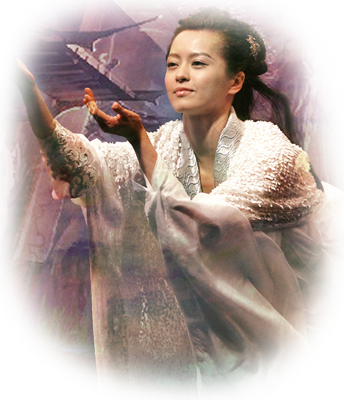 Background: Goddess Nuwa is the daughter of The Jade Emperor and takes the form of a half-crystal, half-human figure. After the failed demon attack on Heaven, she disintegrated herself into thousands of crystals, forming the Southern Heavenly Gate to protect heaven. Any demon would burn to ash upon touching one of the crystals. After the Southern Heavenly Gate was built, a crystal containing The Monkey King fell from the gate’s eye as a tear and crashed on Mount Huago on Earth. Background: Old Sage, a Western monk who traveled from Europe to China in the 7th Century. The monk is the current keeper of a hundred painted scrolls, each describing an event in the Monkey King's life. The Monkey King made more money than The Wolf of Wall Street and American Hustle this weekend, without even having a global release. As the Oscars loom on the horizon, it would be easy to think that one of the front-runners would be dominating the global box office – maybe 'The Wolf of Wall Street’ or David O. Russell’s 'American Hustle’. 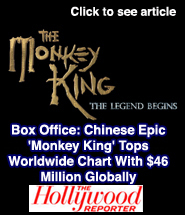 No, the biggest film at the global box office right now is ‘The Monkey King’, never heard of it? Don’t worry, neither had we until we saw the results of the hotly-contested Chinese New Year box office battle. ['Iron Man 3' gets extra scenes for Chinese release] The special effects extravaganza (which looks epic, watch the trailer above), based on a passage from the classical novel ’Journey To The West’, opened in just seven regions on January 31st, raking in an estimated £28m over a three day period. In comparison, the highest-grossing film at the US box office ‘Ride Along' took £7.3m over the same period, in its third week of release. Chinese New Year is historically one of the most profitable weekends in the Chinese cinema year, so it's no surprise a home-grown film took home the lion's (or should that be monkey's?) share. 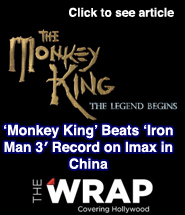 The data from international box office tracking agency Rentrak also shows that ‘The Monkey King’ performed well on IMAX screens taking £1.1m on the Friday along, beating the record for opening day takings of £918,000 previously held by ‘Iron Man 3’. The Hong Kong-made feature which stars Asian cinema heavyweights Donnie Yen (‘Ip Man’, ‘Hero’) and Chow Yun-Fat (‘Hard Boiled’, ‘Crouching Tiger, Hidden Dragon’), tells the story of how the Monkey King (Yen) rebels against the Jade Emperor of Heaven. [Censored version of 'Skyfall' opens in China] ‘The Monkey King’ does not currently have a UK release date, but it’s heading to US cinemas in September. VARIETY - HONG KONG “The Monkey King,” a vfx-heavy re-telling of part of the classic “Journey To The West” tale dominated the Chinese New Year box office — and took top spot in the global rankings. According to local sources, the picture claimed RMB216 million or US$35.4 million in its first two days of release (Jan. 31-Feb 1). Data is necessarily preliminary as China is largely closed for the prolonged holiday period. Overseas tracking agency Rentrak estimates a $46 million three day (Friday-Sunday) cumulative total in the seven territories that “Monkey King” opened. The Hong Kong-made production directed by Soi Pou-cheang and starring Donnie Yen, Chow Yun-fat and Aaron Kwok, enjoyed a 30% market share and beat off TV show adaptation “Dad, Where Are We Going?” Released only in China “Dad” scored RMB171 million ($28 million) to Saturday according to local data, and $34 million through Sunday, according to Rentrak estimates. 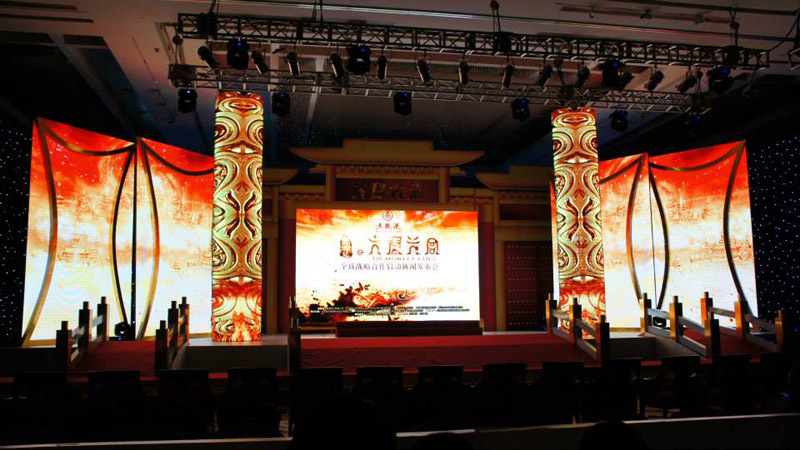 The film scored particularly strongly on the huge circuit of Imax screens in China. Opening on 140 Imax Middle Kingdom screens it kicked off with a $1.8 million opening day, beating the $1.5 million score of “Iron Man 3.” Imax estimates that it will complete the weekend with a $4.5 million cume. “Specifically, Friday is now our biggest Imax day ever, for either a Hollywood or Chinese title,” Imax Entertainment CEO Greg Foster, told Variety. The Rentrak worldwide data also underlines the growing importance of the Chinese box office. The top film in North America, “Ride Along” this weekend grossed $12.3 million according to Rentrak. Chinese New Year, which is tied to the lunar new year and shifts between January and February, is a high point in the Chinese cinema year, along with the pre-Christmas month of December. HOLLYWOOD REPORTER - A trio of films did big business at the Chinese New Year holiday box office, led by Hong Kong director Poi Soi Cheang's The Monkey King. The 3D fantasy epic grossed a massive $46 million to top the weekend's global box-office chart. Most of Monkey King's earnings came from China. The film is playing in a total of seven territories and has earned $54 million to date, according to Rentrak. In China, Imax theaters are reporting record business. Copyrights 2013 © Global Star Production, Inc. All Rights Reserved. GROOVE ASIA - The Lunar New Year 3D film THE MONKEY KING (SAI YAU GEI ji DAI LAU TIN GUNG)'s Mainland opening day broke 5 records, including the opening day box office of 122 million yuan RMB. Despite the box office success the film's word of mouth became a subject of talk, while the team also took a jab at the film WHERE ARE WE GOING, DAD? as "dog fart column series". Two days ago on the Lunar New Year's Day, THE MONKEY KING opened in the Mainland with 122 million yuan RMB. It broke TRANSFORMERS: DARK OF THE MOON's Mainland opening day 118 million yuan RMB box office record. 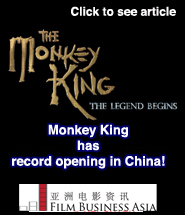 THE MONKEY KING had China's opening day highest box office, the highest single day box office, the first Chinese film to break 100 million on its first day, the fastest Chinese film to reach 100 million. THE MONKEY KING's trend will impact AVATAR with a chance to set the 1.3 billion RMB box office record in the Chinese film market. After 3 days in release in Hong Kong, its cumulative box office was 5.93 million. The "Strongest in the Universe" Donnie Yen Chi Tan was very excited to learn about the box office. "The film's good performance is the result of hard work from the cast and the crew. I will continue to work hard to make good movies, I will be even stronger!" Chow Yun Fat thanked the boss for investing in a special effect epic that took 3 years to produce and the crew for overcoming hardship with their abilities. He said, "Thank you Chi Tan for going above and beyond for us actors!" Kwok Fu Sing said, "The film has such a good box office, which is a great encouragement to the production team. As a part of the film I am very excited." He also said that their effort and perseverance have finally been confirmed. He hoped that the box office will continue to rise and set new records. Director Soi Cheang Po Shui was confident that THE MONKEY KING would receive attention, but over 100 million yuan single day box office that broke the TRANSFORMERS: DARK OF THE MOON first day box office record exceeded his expectation. He said, "TRANSFORMERS 3 is a foreign affair, THE MONKEY KING belongs to us Chinese. I am really very happy!" Someone left criticism on THE MONKEY KING online page, citing the story as rotten and the special effects poor. "It's quite an ability to be able to edit a film so stiffly! Also, not all momentary high resolution is a monkey." The official site replied online, "At least this is a movie, with much more moral than those dog far column series that only took 5 days to shoot and dared to be put on the silver screen!" Meanwhile, WHERE ARE YOU GOING, DADDY's official site yesterday also issued a statement. It claimed that it discovered box office theft and called for online vigilance. 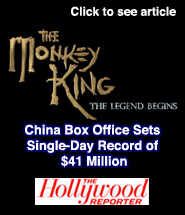 Film Biz ASIA - Box Office News The Monkey King had a record-breaking opening day at the China box office on the first day of the Lunar New Year holiday. Released in 3-D and IMAX 3-D, the big-budget fantasy film – based on the early chapters of Journey of the West – made RMB121 million (US$20.0 million) from 2.81 million admissions on approximately 8,600 screens. Including previews, it has made a total of RMB123 million (US$20.2 million). The Soi CHEANG 鄭保瑞 film, starring Donnie YEN 甄子丹, broke Iron Man 3's RMB105 million (US$17.3 million) record to set a new all-time high for opening day gross. It also set the record for the highest gross for a film on Lunar New Years day and the fastest domestic film to cross the RMB100 million (US$16.5 million) mark. It accounted for approximately 34.9% of all screenings nationwide. 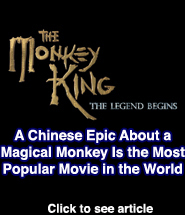 A Chinese Epic About a Magical Monkey. 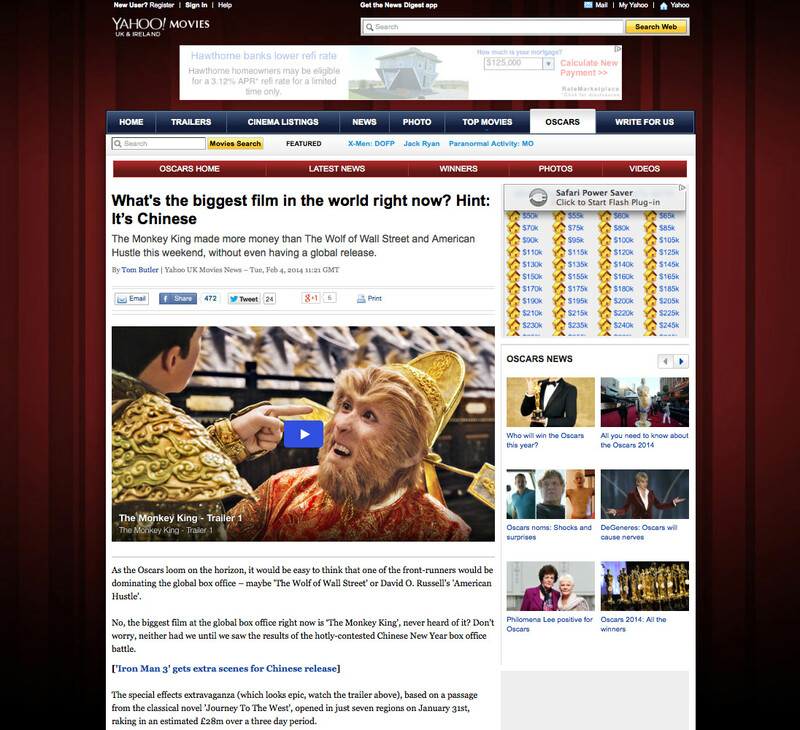 According to the Hollywood Reporter, the most popular film in the world last weekend, taking in $46 million, was The Monkey King, a 3-D epic based on a Chinese legend about a “monkey born from a heavenly stone who acquires supernatural powers.” The story is a prequel to the 16th-century novel Journey to the West, about the introduction of Buddhism to China, which was itself adapted into a highly successful action comedy last year. 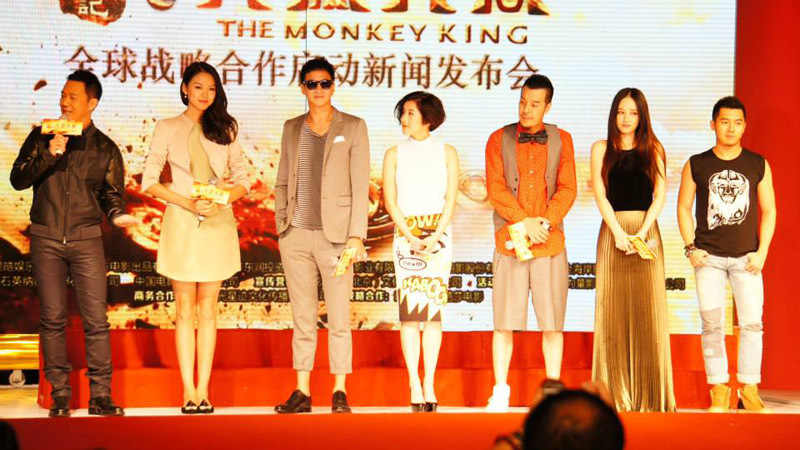 The Monkey King’s big weekend comes almost entirely from Chinese audiences. The beginning of the Lunar New Year is generally one of the biggest box office weekends of the year for the Chinese film market, which became the second-largest in the world over the least decade. Where Are We Going, Dad?,a Chinese documentary based on a reality show about celebrity fathers, was the world’s second-most-successful film over the weekend. The U.S. animated feature Frozen was No. 3. The Chinese film market is increasingly dominated by local productions. In 2012 only three local films cracked the top 10 in China. In 2013 only three Hollywood films were on the list, and domestic pictures accounted for 71 percent of box office revenue. The Chinese government has exercised some cultural protectionism over its film industry, allowing only a certain number of foreign films into the country per year. But interestingly, the increasing share of Chinese movies in the country’s box office comes after a landmark trade deal in 2012 that lifted the number of Hollywood films released in the country from 20 per year to 34. (The extra 14 have to be IMAX or 3-D.) A number of high-profile Hollywood movies, including Gravity and Pacific Rim, have added China-friendly elements with an eye on pleasing Chinese audiences (and censors). The 3-D requirement leads to some odd choices for the American films China gets to see. 2014’s selections include the flop The Mortal Instruments: City of Bones and the straight-to-video animated movie Saving Santa. Maybe it’s not so surprising that Chinese audiences are sticking with homegrown hits. As for the Monkey King, U.S. audiences will have to wait until September to see what they’ve been missing. IMAX Enjoys Its Biggest Opening Day At The Chinese Box Office. BEIJING and LOS ANGELES, Feb. 4, 2014 /PRNewswire/ -- IMAX Corporation (NYSE: IMAX; TSX: IMX) announced today that its network of IMAX® theatres in China enjoyed its biggest single box-office opening day on Friday, Jan. 31, the first day of the Chinese New Year, grossing a record $1.8 million across 140 screens. Driven by the stellar performance of The Monkey King, the martial-arts-themed local-language hit from Global Star Productions, Filmko Pictures and China Film Group, Chinese IMAX theatres bested their previous single-day mark of $1.5 million, established in 2013 with the release of Marvel's Iron Man 3. 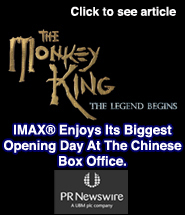 The Monkey King's record-breaking first day kicked off what is certain to be a strong week-long Chinese New Year holiday for IMAX. Over the three-day holiday weekend, local IMAX theatres took in a robust $4.5 million. 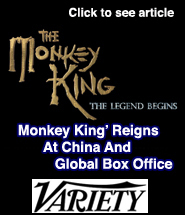 "We'd like to congratulate our partners, Global Star Productions, Filmko Pictures and China Film Group, on making such a spectacular, action-fueled film that resonates so well with IMAX audiences," said Greg Foster, CEO of IMAX Entertainment and Senior Executive Vice President, IMAX Corp. "The Monkey King is a great example of the kind of performance that can happen when the right film is presented in The IMAX Experience®, and we look forward to seeing how the rest of the holiday week unfolds." Directed by Pou-Soi Cheang, The Monkey King serves as an origins story to Wu Cheng'en's classic The Journey to the West, with acclaimed martial artist and action star Donnie Yen playing the title role of the Monkey King, alongside Yun-Fat Chow and Aaron Kwok. The IMAX release of The Monkey King has been digitally re-mastered into the image and sound quality of The IMAX 3D Experience® with proprietary IMAX DMR® (Digital Re-mastering) technology. The crystal-clear images coupled with IMAX's customized theatre geometry and powerful digital audio create a unique environment that make audiences feel as if they are in the movie. 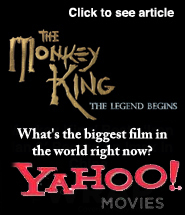 Click here for Article: The monkey king breaks 300 million in 3 days. Donnie Yen Chi Tan, Chow Yun Fat and Aaron Kwok Fu Sing starred in the film THE MONKEY KING (SAI YAU GEI ji DAI LAU TIN GUNG), which after 3 days of release in the Mainland accumulated over 300 million RMB at the box office. Sun Wukong has become the fastest box office gold mine in the history. THE MONKEY KING opened on the Lunar New Year's Day and broke TRANSFORMERS: DARK OF THE MOON's 121.78 million yuan highest opening day box office with 122 million and the highest single day box office record. The film after 3 days in release accumulated 310 million yuan and set the fastest to reach 300 million yuan in China box office record. WHERE ARE YOU GOING, DADDY? accumulated 251 million RMB and was hot on THE MONKEY KING's tail. Yen Chi Tan was called the box office "gold inhaling monkey". He joked that he just did his best. The title was just everyone's generosity, proving that his effort was not wasted. Yen Chi Tan said that he would be even happier if all Lunar New Year films had good box office. Blossoming with variety would be a good thing, he hoped that the Year of the Horse would bring even more and better films to viewers. When he played Sun Wukong he had to wear long and sharp fake teeth that kept him from closing his mouth while bruising his gum. He said that the memory was painful, but the audience acceptance of his interpretation and the box office performance were worth all his hard work. As for the Hong Kong box office (ending February 2), THE MONKEY KING was no match for Sandra Ng Kwan Yu's GOLDEN CHICKEN SSS (GUM GAI SSS) and the Chow Yun Fat and Nicholas Tse Ting Fung starred FROM VEGAS TO MACAU (DOH SING FUNG WON). GOLDEN CHICKEN SSS led with HK$17.27 million. FROM VEGAS TO MACAU tightly followed with 16.24 million. THE MONKEY KING made 12.2 million. HELLO BABIES (LUK FUK HEI SI) made 9.34 million. GOLDEN CHICKEN SSS director Matthew Chow Hoi Kwong last night announced the latest box office on facebook. As for 7:32PM the film has already exceeded 20 million at the box office. Sing Sing appeared on the Cable program Film Montage. 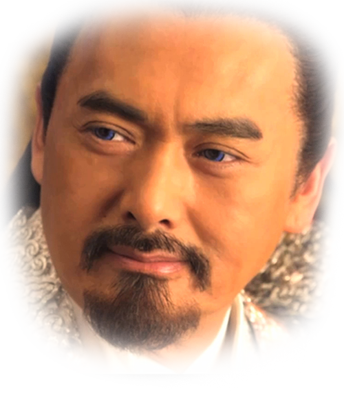 Speaking of working with Chow Yun Fat and Yen Chi Tan, he became "Bull Demon King" possessed as he said in a deep voice to display his Demon King presence, "I want to kill them!" In the film he and Fat Gor were at war, sparks flew from their collaboration. Sing Sing said that Fat Gor was a god class actor, he was not pleased with just one collaboration as he hoped to work with him again on COLD WAR 2 (HONG JIN 2). He also worked with Yen Chi Tan for the first time. 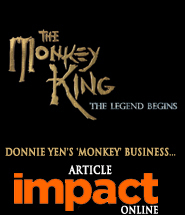 When the "Dance King" and the "Martial Art Grand Master" dueled, Sing Sing appreciated Yen Chi Tan for bringing the magic monkey to life as they exchanged admiration. 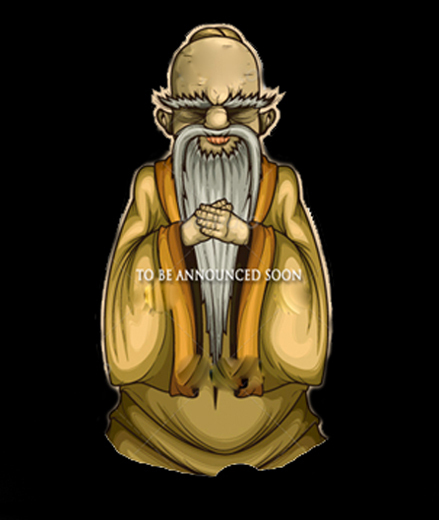 Reportedly Filmko is already planning a sequel that will start production in September with the addition of the Venerable Monk Tang, Piggy and Sandy. 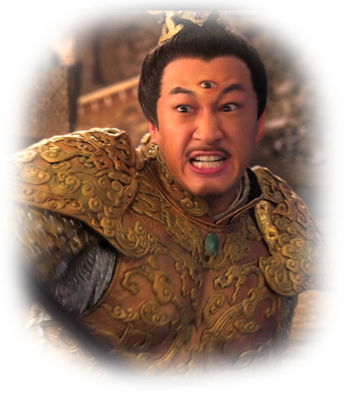 At the end of THE MONKEY KING, Goo Jai narrated the film and already hinted that he will play Tang. Reportedly Mainland hunk Huang Xiaoming will play Piggy. In the story the Tang Monk and his disciples including Sun Wukong headed west to retrieve scriptures, ran into demons on the way and had to eliminate them. 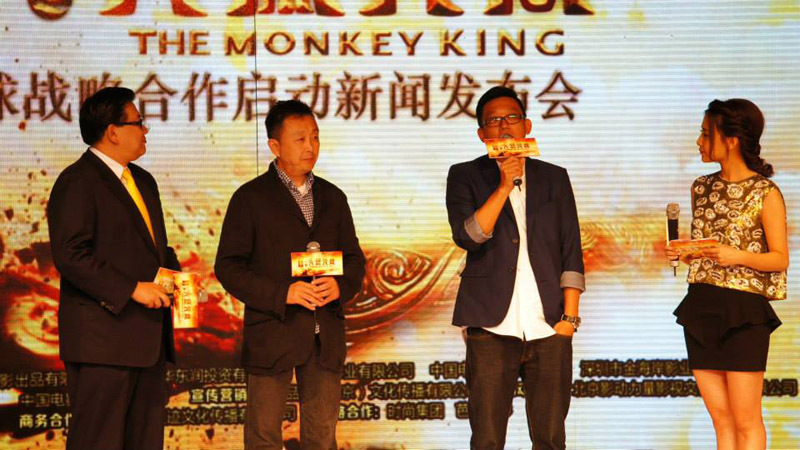 Filmko boss Alex Wong Hoi Fung said, "Right now we are focused on THE MONKEY KING box office. Will we make a sequel? When? Who will direct? I really haven't thought about it. Wait until when it is actually confirmed for production, then we will naturally notify you." Click here for Article: China Box Office Sets Single-Day Record of $41 Million, Driven by Local Films. 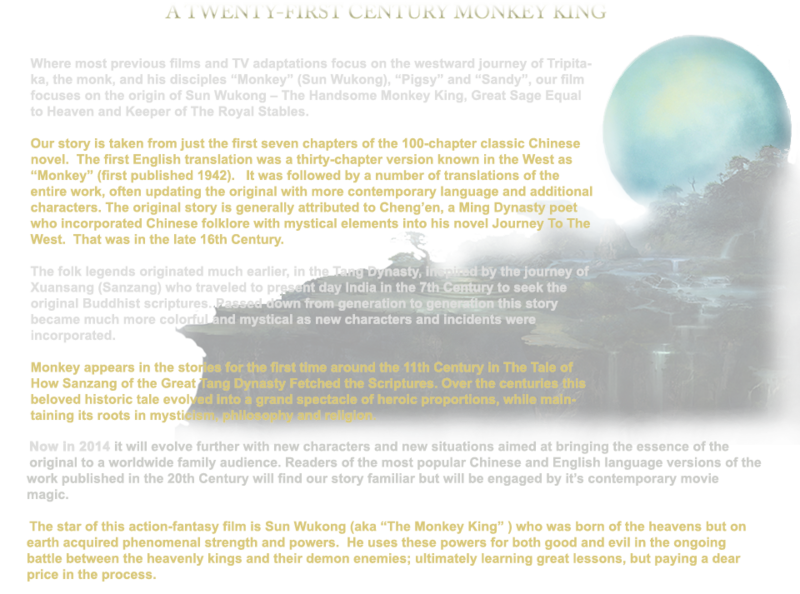 Fantasy epic "The Monkey King" and reality TV adaptation "Dad, Where Are We Going?" both opened huge during the Lunar New Year holiday, while Disney's "Frozen" is expected to make a strong bow Wednesday. Just a few days into the Year of the Horse, the Chinese box office is already galloping full steam ahead. The first day of the Lunar New Year holiday was a record-breaking one, as box-office sales across China totaled $41 million, beating the single-day record of $34 million set last year on Valentine's Day. 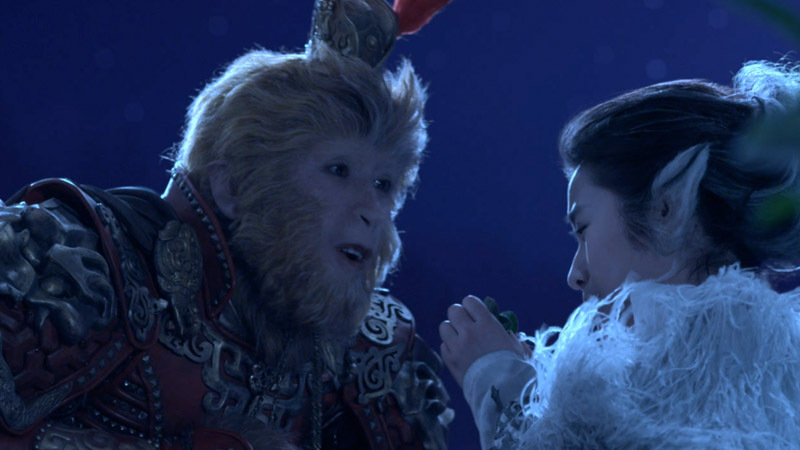 By Feb. 3, after four days on release, Hong Kong director Poi Soi Cheang's 3D fantasy epic The Monkey King racked up $64.35 million (389.97 million yuan), while Dad, Where Are We Going? took $50.97 million (308.91 million yuan) over the same period. Imax Theaters said Tuesday that it took in a single-day record $1.8 million in China on Friday, powered by the local hit “The Monkey King.” The martial arts action film’s debut on 140 Imax screens came on the first day of the Chinese New Year, and topped the $1.5 million mark set by Disney and Marvel’s “Iron Man 3” in 2013. It took in $4.5 million from Imax sites over its first three days. It was a huge overall weekend at the Mainland box office, and Chinese films were first and second worldwide. Also read: ‘Wolf of Wall Street’ Howling at Overseas Box Office The 3D “The Monkey King,” starring Chow Yun Fat, Aaron Kwok and Donnie Yen, rolled up more than $51 million over the weekend. It was produced by Global Star Productions, Filmko Pictures and China Film Group, and directed by Pou-Soi Cheang. “Dad, Where Are We Going,” based on a reality TV show in which fathers and their pampered kids rough in the outdoors, was second with more than $40 million. Also read: ‘Despicable Me 2′ Dominates in China Box Office Debut “We’d like to congratulate our partners, Global Star Productions, Filmko Pictures and China Film Group, on making such a spectacular, action-fueled film that resonates so well with Imax audiences,” said chief executive and senior executive vice-president Greg Foster. Donnie Yen talks about the challenges. Being both the lead actor and action director of a movie is par for the course for Donnie Yen Ji-dan. After all, the action superstar has appeared in some 60 films and has been the action director on about 20 – many of which he also starred in. But Yen says doing double duty on his latest film, HK$600 million fantasy epic The Monkey King, took things to a whole new level. 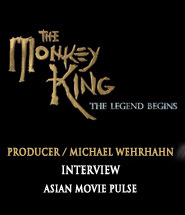 “The Monkey King represents the most enormous challenge of my whole career. There were so many things going on on a daily basis,” says Yen, 50. Donnie Yen looks to be having quite a busy year ahead of him with several high-profile projects. In 2010, production began on director Soi Chiang's (Accident, Motorway) big screen adaptation of the legend of the Monkey King, starring Donnie Yen, Aaron Kwok and Chow Yun-fatt. 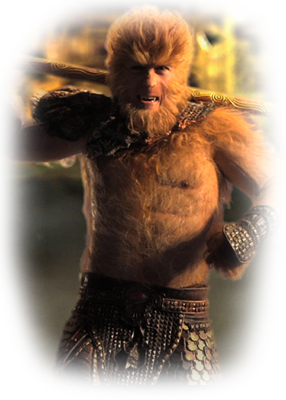 The Monkey King was shot in IMAX 3D and employed visual effects talent from Hollywood personnel who had worked on films like I Am Legend and Spider-Man 3. Filmko have finally announced a release date of July 4th 2013, which could see it going head to head with Stephen Chow's Journey to the West, another take on the Monkey King legend. The premise of the film has been issued: Ever since the beginning of time, it was the deities who had maintained the order of the heaven and earth. However, owing to their evil predisposition, the demons weren't content with being subservient to deities all the time. To take the controlling power from deities, the leader of the demon tribe, Buffalo Demon King mounted an attack against the deities in heaven, but he lost out to Jade Emperor of the deity tribe at last and was expelled to Flaming Mountain on earth. Though the battle was drawn to a close, heaven was left in ruins and rubble. For the sake of harmony among deities, demons and humans, the goddess Nuwa turned herself into multicoloured crystals with which she mended heaven. To protect heaven from demonic ambush again, she also built the South Heavenly Gate with the same crystals. The Gate was imbued with strong divine magical power so that any demonic being coming close to it would vanish into ash. Despite the utmost care she used, Nuwa dropped one of the crystals fell to the earth leaving an opening on the Gate. As the crystal fell, it gathered the solar and lunar energies throughout hundreds of thousands of years and it turned into a celestial foetus. A divine monkey was born at last and he was the pivotal figure related to the security and safety of the heavenly palace. This divine monkey has exceptional innate talent and intelligence. He learns magic from the Old Master Puti, the magic tricks to ride on flying cloud, freeze people's action and transform himself into 72 different beings. Meantime, a giant wall of water hit Flaming Mountain, where Buffalo Demon King lived. The Demon King knew it was time to pull off his plan to attack heaven by playing the divine monkey off against heaven, so that he could take the controlling power from the deities. The first official artwork for the film has been released and also a new teaser, giving a glimpse at what to expect from a project Donnie Yen has called one of his 'most challenging' for the intensive five hours of daily make up needed to transform him into the title character. The films post-production has been supervised by actor turned Executive Producer Michael Wehrhahn, and we'll be talking to him about the project in the next few months. Donnie Yen's 'Monkey King' woos mainland film buffs. Donnie Yen's 'Monkey King' woos mainland film buffs, breaking box office records. 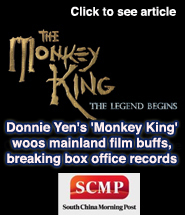 Click here for Article Donnie Yen's 'Monkey King' woos mainland film buffs, breaking box office records. The Monkey King in 3D, a cinematic rendition of Wu Cheng'en's 16th-century epic tale Journey to the West, has wooed Chinese movie goers after an extremely successful debut, grossing 400 million yuan within four days of its opening, Chinese media reported. The record-breaking film was sold out in many cities and film lovers were forced to buy tickets one day in advance, news portal Netease reported. Directed by famed Hong Kong director Cheang Pou-soi and with action star Donnie Yen as the protagonist Sun Wukong, the action-driven plot traces the path that led the Monkey Sun to become the disciple of the monk Xuanzang. In addition to its 3D animation and its beautiful illustration, the film's star-studded cast is believed to have played a part in its success. 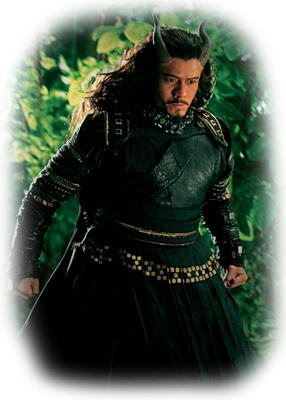 Hong Kong actor Aaron Kwok Fu-shing stars as the Buffalo Demon King, and Chow Yun-fat takes the role of the Jade Emperor. Both actors enjoy soaring popularity in the mainland. 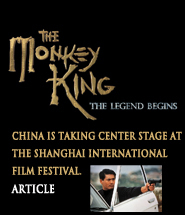 Click here for Article China is taking center stage at the Shanghai International Film Festival. Watch The Brand New Trailer For THE MONKEY KING: THE LEGEND BEGINS! 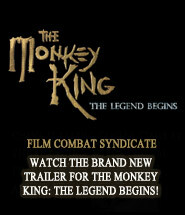 Watch The Brand New Trailer For THE MONKEY KING: THE LEGEND BEGINS!. 16th Shanghai International Film Festival (SIFF), Hong Kong megastars Chow Yun-Fat, Donnie Yen and Aaron Kwok posed with three very flashy, custom motorbikes – each representing their respective characters in the film – to promote their new 3D fantasy flick, The Monkey King. Make sure you have the newest Flash Player to play. Download here.